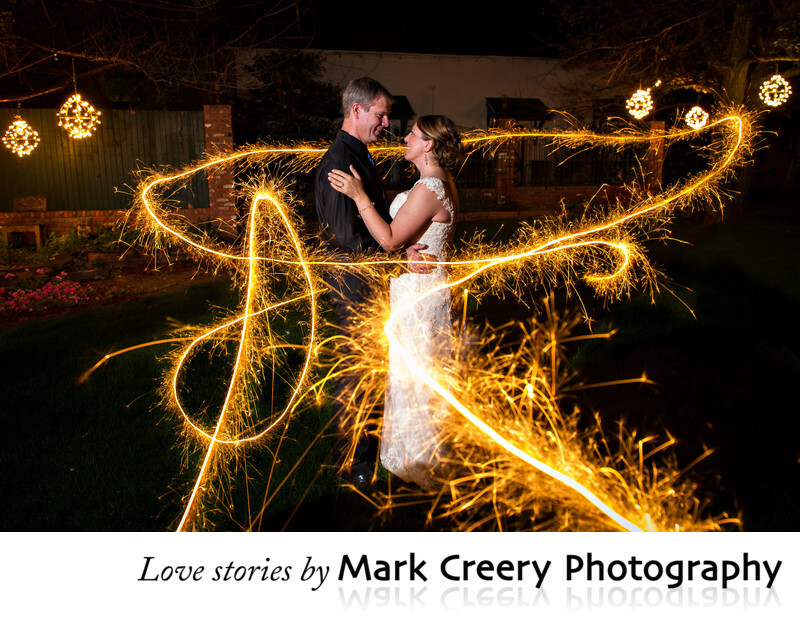 This wedding photograph was taken at the Gatehouse at Lionsgate Event Center at night with sparklers. It was achieved using an off-camera flash to light the couple and a longer exposure to give me time to run around the couple with a sparkler. This also let the ambient lights in the background to be brighter and more prominent. I took several tries to make sure I got a pattern that worked well, but the couple enjoyed the whole process. We had lots of kids watching too as I'm sure it looked funny to them. Sparklers are a different way to get some creative photos to remember your day by, and well worth getting away from the guests at the reception to make this happen. Along with the Gatehouse, the Dove House is another venue at Lionsgate that has a very nice grounds and reception venue. Lionsgate Event Center is located in Lafayette, Colorado. Contact: (303) 665-6525, info@lionsgatecenter.com. Location: 1055 S 112th St, Lafayette, CO 80026.